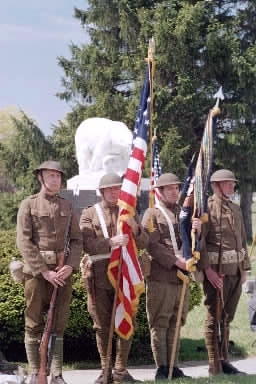 The "Detroit's Own" Polar Bear Memorial Association is dedicated to honoring and maintaining the memory of the 339th Infantry Regiment, the 1st Battalion of the 310th Engineers, the 337th Ambulance Co. and the 337th Field Hospital of the U.S. Army's 85th Division. These men, officially designated the American North Russia Expeditionary Force (ANREF) and also known as "Detroit's Own" and "Polar Bears", were sent by President Wilson to North Russia where they fought the Bolshevik Red Army from September 1918 through June 1919. - "Guardian of the Bear"
To join the Association or renew, please use this form. Our VP Kevin Stark has been working with Charlevoix Screen Masters in Charlevoix, Michigan to make available a nice selection of embroidered and silk-screened shirts and caps that carry the ANREF Centennial logo as well as the Polar Bear logo. "Polar Bear Wear" can now be purchased on-line directly and securely from Charlevoix Screen Masters by visiting our "store" at this link. If you see something you like, create an account and fill your shopping cart! All major credit cards are accepted. Please allow 3 to 4 weeks for delivery. This painting depicts Sgt. Mike Burke’s machine gun squad of “G” Co., 339th Infantry Regiment in combat at Karporgora on the Pinega River front in North Russia. Sgt. Burke is shown firing his Lewis machine gun as the soldier to his right prepares to provide re-loads. That soldier is Cpl. John Toornman, who created this painting from memory. Pvt. Louis H. Stark is the soldier with the wounded left forearm. 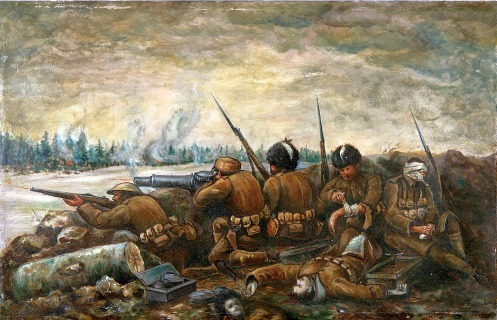 At the bottom center of the painting are the two men who were killed in this battle, Pvt. Jay Pitts and Pvt. Clarence Malm. They both now rest in peace at the foot of the Polar Bear monument at White Chapel Memorial Park Cemetery in Troy, Michigan. Cpl. John Toornman made this painting in the early 1920’s, around the same time that the Polar Bear Association was organized and began holding reunions. John put his painting in his basement, where it stayed until the early 1980’s when he brought it out to show author Dennis Gordon who was researching his book, “Quartered in Hell”. Gordon received permission to use Toornman's painting as the cover artwork for his book, which has been out of print for decades. Toornman later gifted the painting to his son, Gene, who has owned it now for nearly 30 years. During the filming of “Voices of a Never Ending Dawn” in March 2009, Gene Toornman shared his painting with the film producers and the grandson of Pvt. Louis H. Stark. Now in 2018, the Toornman family has graciously made this painting available to the Polar Bear Memorial Association for use in their centennial commemorations of the service and sacrifice of the Polar Bear soldiers. A limited number of 12” by 18” color print reproductions of this painting are available by mail order. They are printed on 100 lb paper weight stock and are suitable for framing. Prints are priced at $15.00 each + $10.00 shipping and handling per order. Contact PBMA Vice President Kevin Stark by email at to place your order. Captain Matthew J. DiRisio is a United States Army officer currently in graduate school pursuing a MA in history through George Mason University prior to a new assignment where he will teach history to the cadets at West Point. Capt. DiRisio recently reached out to the Polar Bear Memorial Association, writing, "I am currently working on a project studying the public memory of the Polar Bear Expedition. I became interested in the Polar Bear Expedition when I was in middle school and my parents bought me the book "When Hell Froze Over" for my birthday. Fast forward more than a decade and I am in grad school and finally able to do some research/writing on the topic. My project concerns how the public memory of the Polar Bear Expedition stayed alive regionally versus nationally. My professor bet me that I would not be able to find enough information on the 339th to write a 3,000 word paper." Capt. DiRisio won that bet. Here is his finished project: "Frozen in Time: Public Memory, the Polar Bear Expedition, and the Triumph of the Regional Vernacular"
Browse the lists of official captions for (510) photographs taken in North Russia by the U.S. Army Signal Corps.The lists are complied in order of increasing SC number. The SC number is usually found in the lower left hand corner of the image, next to the U.S. Army Signal Corps logo. Many of the captions identify the subjects in the photo by their name, rank and/or unit. Information on how to obtain copies of these photos can be found on this page. VISITORS TO THE PAGES OF THE POLAR BEAR MEMORIAL ASSOCIATION WEB SITE SINCE JULY 6, 2002.